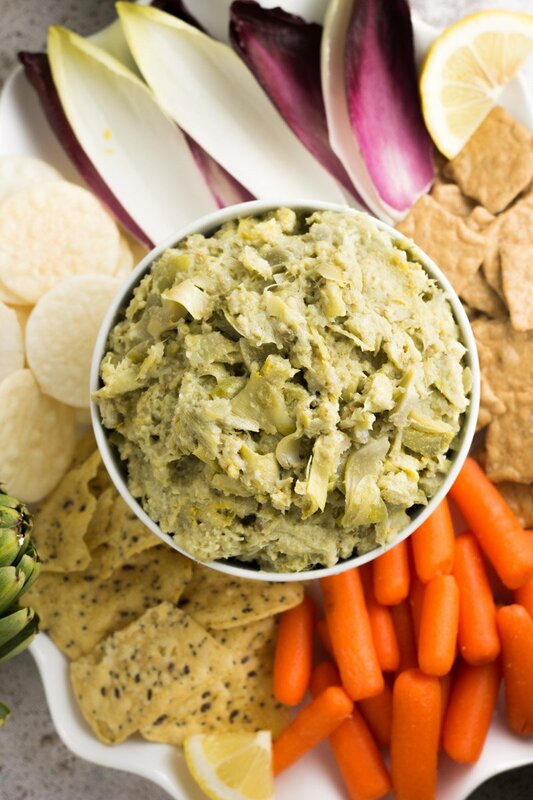 The perfect low-calorie dip to keep summer snacking healthy, this skinny paleo lemon artichoke dip is made of simple ingredients that pack major flavor. Great with chips, crackers, vegetables, or over grilled meat, and void of mayo, sour cream, or cheese! Gluten free, dairy free, and vegan. This post is sponsored by the awesome people at Ocean Mist Farms. As always, all opinions are 100% my own. Thanks for supporting Physical Kitchness! FRIDAY FRIDAY FRIDAY FRIDAY! Chant with me now. Even though chances are it’s not Friday when you’re reading this post, it’s Friday when I’m writing it, so THIS girl is pretty stoked and giddy for the weekend. Also giddy that my kids are finally napping for the afternoon. 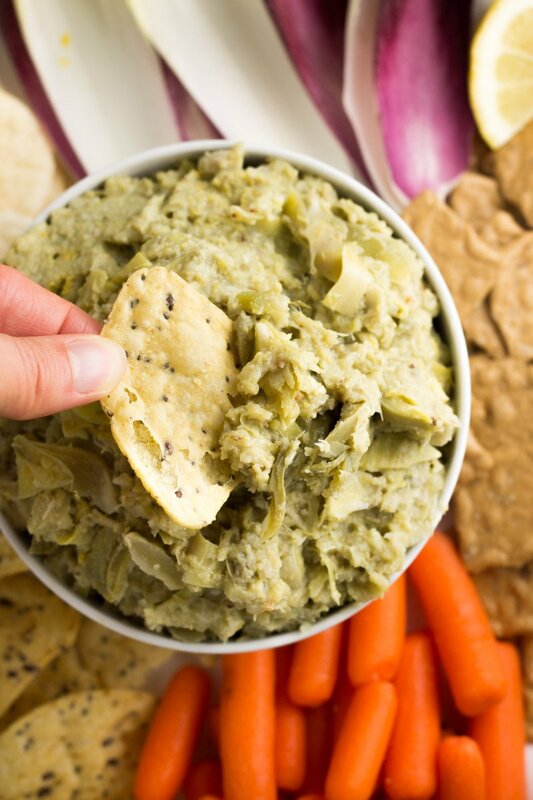 It’s been a crazy morning and this skinny paleo lemon artichoke dip has me enjoying a new take on comfort food after the meltdowns, without the guilt of traditional calorie-loaded artichoke dips. Anyone else been there? You FINALLY reach nap time after a stretch of 5:30am (yes, my kids get up stupid early) to 12:30pm. And that seven hours almost, ALMOST killed you. I tend to scour my kitchen for anything I can eat as a gift to myself for a job well done (aka survival) once my kids are down. I know, it’s probably one of the worst habits to reward myself for doing my job as a mother with food, but I can’t be the only one (right?…please, say right). Sometimes I’m good and mindful. I grab my sparkling water and head in to the other room. VICTORY! Other times I’m so fried I just want to reach for….well fries. Ok scratch that, chips and dip. YAAAAS for crunchy and creamy!! 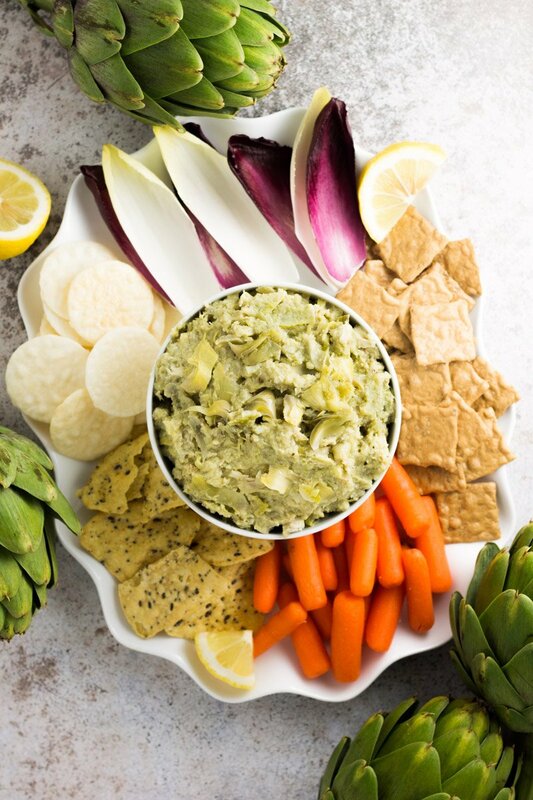 Today was one of those days, but luckily I whipped up this skinny paleo lemon artichoke dip the day before, and dipped every chip, cracker, endive boat, and carrot I had while celebrating my children still having all their limbs. And I got the treat I craved without feeling bad about my mini snack binge. Now for a girl that’s a tad intimidated by fresh artichokes, this recipe idea had me a little nervous. Although ‘food blogger’ is my job, I’m more of a ‘throw some ground beef in that pan and brown it’ or ‘preheat the grill and put a chicken breast in it’, or even better, ‘add all this to a blender then pour and bake’ kind of gal. I’m not super fancy, I just dig easy, tasty stuff that’s healthy. Can I get an amen? Artichokes scared me. Beautiful, but scary. But to my surprise these Ocean Mist Farms fresh artichokes were super easy to make, and oh em gheeeee the flavor compared to my typical “artichokes in a can” knocked my socks off. Fresh artichokes, where have you been all my life?!? Making these bad boys was a lot more simple than I thought, so of COURSE I needed to share how to make the healthiest summer dip in the simplest way for the best snack to ever hit your mouth! Simply cut the top off each fresh Ocean Mist Farms artichoke (roughly 3-4 inches off the top) and place into a boiling pot of water with a dash of salt. The artichoke(s) will float to the top, so you could use a glass lid from a casserole dish to submerge, but I didn’t feel the need to – eventually the artichokes stayed submerged and cooked just fine! Continue to keep the water at a gentle simmer, cooking the artichokes for about 30 minutes, or until softened. 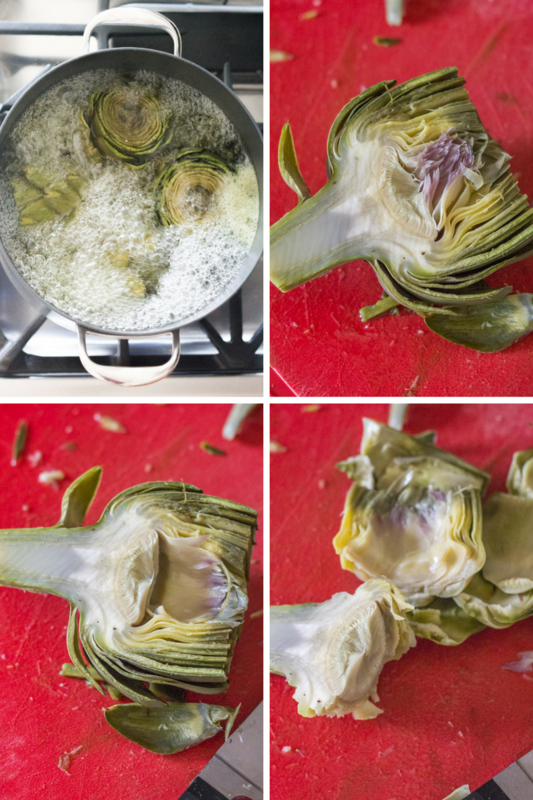 Remove the artichokes from the water and cut in half. Scrape out the fluffy purple fringe inside (yes, that’s technical term) then gently peel off the outer leaves, leaving the heart of the artichoke separated. Keep the heart and the softened leaves that were closest to it (those particular leaves will be soft from top to bottom). Anything that feels hard or uncooked can be discarded OR used as a dipper for the dip (another technical term). Then add the artichoke hearts, roasted cauliflower, almond milk, nutritional yeast, and fresh lemon juice to a blender or food processor and blend to combine. 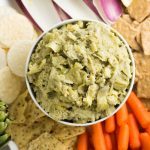 And if telling you this skinny paleo lemon artichoke dip is easy to make, Whole30 compliant, and perfect as a side for grilled meat this summer isn’t enough to convince you to try, what I’m about to announce is EPIC…. Ocean Mist Farms is giving away a getaway for two to a Sandals Beach Resort of the winner’s choice, valued at $4,000! Plus, two secondary winners will receive $500 Visa gift card and four third prize winners will receive a $250 Visa gift card. 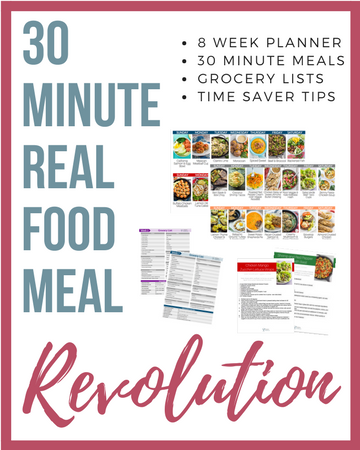 BUT WAIT, Physical Kitchness readers specifically will be entered in a giveaway for a $500 Visa gift card. Artichokes, vacation, money? Seriously what more do you need? To enter the giveaway, click HERE. 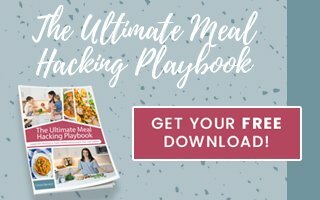 After you’ve entered, you’ll also be able to download a FREE eBook, The Skinny Dips – a collection of low-cal dips perfect for the summertime. Boil the artichokes beforehand, cut, and refrigerate before making the dip. You can also roast the cauliflower beforehand and refrigerate until ready. 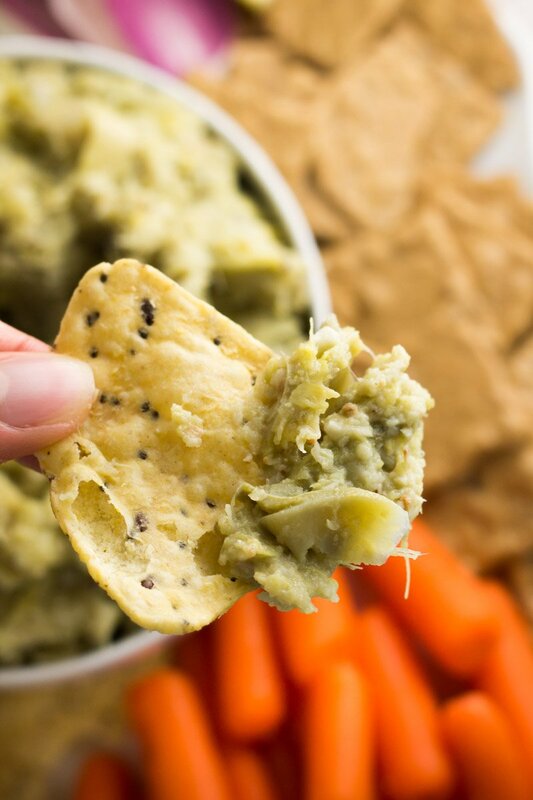 Since this dip is served cold, assembling in steps and refrigerating is completely fine, and let’s face it, necessary during those crazy mom life days! We LOVE artichoke dip in our house. :o) I totally agree that chips and dip can just really hit the spot as a snack sometimes. 🙂 I bet you need a snack after doing that amazing mama thing you do every day. Hahaha I am a snacking QUEEN! I hope you and your family love this dip Emily! Oh I just know you. Hehehe jk. Healthy and yummy is always a winning combo! Thanks Cara. OH. MY. GOSH. Looks amazing! I will have to try this out! Enjoy Morgan! I’m still making batches and batches of this to have on hand! this looks so delicious and what a fun new “treat” to take our friends house for backyard patio party this weekend! Would this be easier and possible if you just used some canned artichoke hearts?! Hi Laura – although it might be easier, the taste of fresh compared to canned is so different. Canned artichokes are also packed in water, which may yield a runnier dip. You could certainly try, but for optimal results I’d probably stick to fresh. Keep me posted!